Tie a wedding bow in minutes. 2 How do I Clean Silk Ribbon? 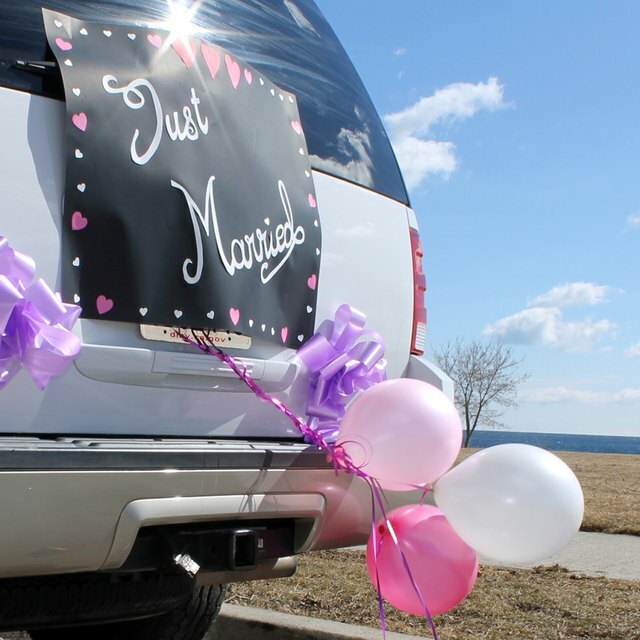 Decorating a the bride and groom's getaway car with bows is part of a wedding tradition where members of the bridal party decorate the couple's car with ribbons, empty tin cans and announcements—which can be written in chalk or washable paint. Making a car bow is easy and only requires a few minutes. Lay your ribbon completely flat on a hardwood floor or other hard surface. Flatten the ribbon with books, if necessary. Let stand overnight. It is best to complete this task the day before the wedding. Open the driver and passenger-side doors. Pull one side of the ribbon out both car doors toward the front hood. Close both doors. Drape the ribbon across the front of the hood and down the front bumper. Thread the ribbon through the front hood ornament, if you have one. If you do not, don’t worry, you will add adhesive pads later. Tie a bow in the same way that you would tie a pair of shoelaces. Check that the ribbon rests on the front bumper and does not cover the front license plate. Secure the ribbon to your car with adhesive pads, which are available as part of a wedding ribbon kit. Set each adhesive pad in place under the ribbon. Press down on the ribbon as necessary to secure the hold. Space the pads along the length of the hood and at the front of the bumper where your bow is placed. Use adhesive pads that are specially designed to temporarily stick without stripping the paint on a car. Because ribbon is typically spun around a spool, it may need to remain under the books for at least 24 hours to completely flatten.